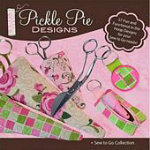 The Sew To Go Collection includes 31 great embroidery projects to help you carry, store, and identify your sewing supplies when you bring them along to sewing classes and quilting bees Contains scissor cases in 3 sizes, 26 monogrammed scissor fobs, USBJump drive single and double cases. Projects to be created using hoops sizes 5x7, 6x10, and 4x4. Formats: ART, PES, JEF, HUS, EXP, VIP, DST.